Engagement rings, diamond jewelry, platinum jewelry, and wedding bands from DiamondsHere. Welcome to DiamondsHere.com!...........Tuesday, January 29, 2019..........Your trusted source for ideal cut and the popular Hearts and Arrows (tm) diamonds and fine jewelry since 1984!........Buy Coin Jewelry at discount prices - large inventory - discount prices!............for Wednesday, January 15, 2014..........CHECK OUT OUR PRICES ON DIAMOND STUD EARRINGS!........at DiamondsHere.com, you will never pay retail again!..........BE SURE TO COMPARE OUR QUALITY, PRICE, and VALUE! Diamond Engagement Rings are a DiamondsHere.com specialty......we offer the fabulous HEARTS & ARROWS (tm) cut diamond all certified by GIA, AGS, or EGL...check out our certified diamond page for nationally competitive prices and excellent value!.........Most mountings and rings are available in both 14K and 18K white and yellow gold, as well as timeless platinum! ........Check out our loose diamond inventory for popular shapes and sizes including the popular Hearts and Arrows (tm) cut...all sold at our low discount prices!..........SHOP AND SAVE at Diamondshere! 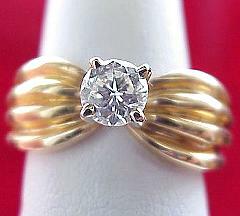 The solitaire is a timeless classic! A lovely 0.58CT diamond with E Color, VS2 Clarity. You are buying a diamond that has been certified and has IDEAL proportions! GET THE QUALITY YOU PAID FOR...BUY CERTIFIED DIAMONDS FROM DIAMONDSHERE! (Sizing included). 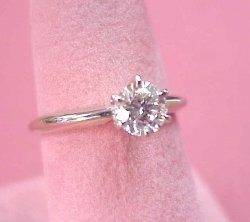 The solitaire is a timeless classic! A lovely 0.73CT diamond with H Color, VS2 Clarity. You are buying a diamond that has been certified and has IDEAL proportions! 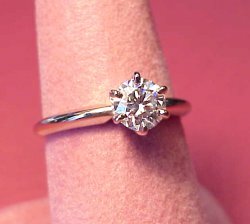 GET THE QUALITY YOU PAID FOR...BUY CERTIFIED DIAMONDS FROM DIAMONDSHERE! (Sizing included). 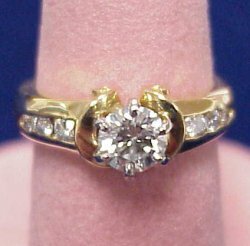 Please call us for our CASH DISCOUNT prices on our diamond engagement rings! Your satisfaction is guaranteed at DiamondsHere...AND...NO SALES TAX IN OREGON! 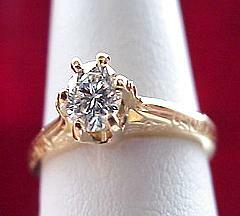 0.55CT Ideal cut Hearts and Arrows center diamond set in our custom 18K Euro style square shank. 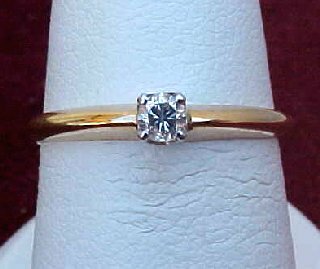 0.50CT pear cut diamond of H Color, VS1 Clarity set in this lovely channel set 14K diamond band. 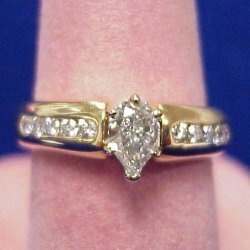 0.32CT Marquise cut diamond of G Color, I1 Clarity, set in solid 14K gold! 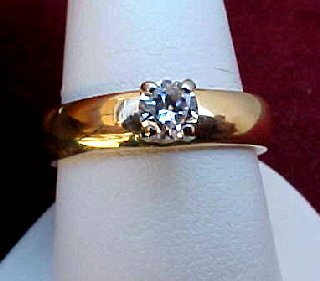 0.40CT round brilliant cut diamond of H Color, I1 Clarity, set in popular 14K gold! 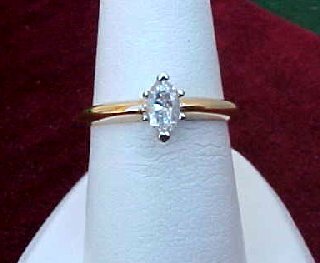 You will be going steady when she receives this lovely 0.10CT round brilliant cut diamond of G-H Color, SI1 Clarity and set in 14K gold! She will love this princess cut solitaire engagement ring. 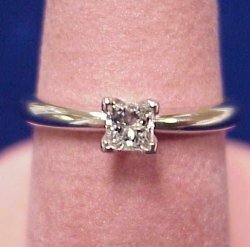 The diamond is 0.31CT of G Color, VS Clarity. This is a beautiful diamond, you won't be disappointed. 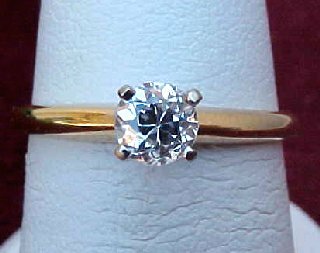 One of our most popular sellers at Diamondshere...A lovely 0.29CT round brilliant cut diamond of G Color, VS2 Clarity, set in a beautiful 14K gold mounting! 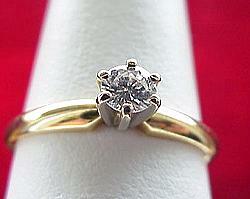 0.25CT round brilliant cut diamond of H Color, SI1 Clarity, set in popular solid 14K gold!